Salinicoccus carnicancri Jung et al. 2010 belongs to the genus Salinicoccus in the family Staphylococcaceae. Members of the Salinicoccus are moderately halophilic and originate from various salty environments. The halophilic features of the Salinicoccus suggest their possible uses in biotechnological applications, such as biodegradation and fermented food production. However, the genus Salinicoccus is poorly characterized at the genome level, despite its potential importance. This study presents the draft genome sequence of S. carnicancri strain CrmT and its annotation. The 2,673,309 base pair genome contained 2,700 protein-coding genes and 78 RNA genes with an average G+C content of 47.93 mol%. It was notable that the strain carried 72 predicted genes associated with osmoregulation, which suggests the presence of beneficial functions that facilitate growth in high-salt environments. The genus Salinicoccus in the family Staphylococcaceae was first proposed by Ventosa et al. (1990) and is defined as moderately halophilic, aerobic, Gram-positive, non-motile, non-sporulating, and heterotrophic cocci . The genus name is derived from the Latin adjective salinus, saline, and the Greek masculine noun kokkos, meaning a grain or berry, i.e., saline coccus . Most species in the genus Salinicoccus have been found in salty environments, such as fermented foods [3-5], solar salterns [1,6], salt mines [7,8], a salt lake , and saline soils [10,11]. All type strains of Salinicoccus species were characterized as halotolerant organisms, where NaCl concentrations of 2–20% (wt/vol) were suitable for growth [12-14]. These moderately halophilic bacteria can survive in salt-rich environments and grow optimally at 5–20% (wt/vol) NaCl . These bacteria can utilize compatible solutes or osmolytes, such as carbohydrates, amino acid, polyols, betaines, and ectoines, by regulating their osmotic concentrations in high-salt content environmental conditions [16,17]. Therefore, these organisms may have biotechnological importance with possible applications in food biotechnology for the production of fermented food , in environmental biotechnology for the biodegradation of organic pollutants and the production of alternative energy . Strain CrmT (= DSM 23852 = JCM 15796 = KCTC 13301) is the type strain of the species Salinicoccus carnicancri. This strain was isolated from a traditional Korean fermented seafood, known as ‘ganjang-gejang,’ which is made from raw crabs preserved in soy sauce . The species name was derived from the Latin nouns caro carnis, flesh, and cancer -cri, a crab, i.e., the flesh of a crab . The strain can grow in 0–20% (wt/vol) NaCl with optimal growth at 12% (wt/vol) NaCl . 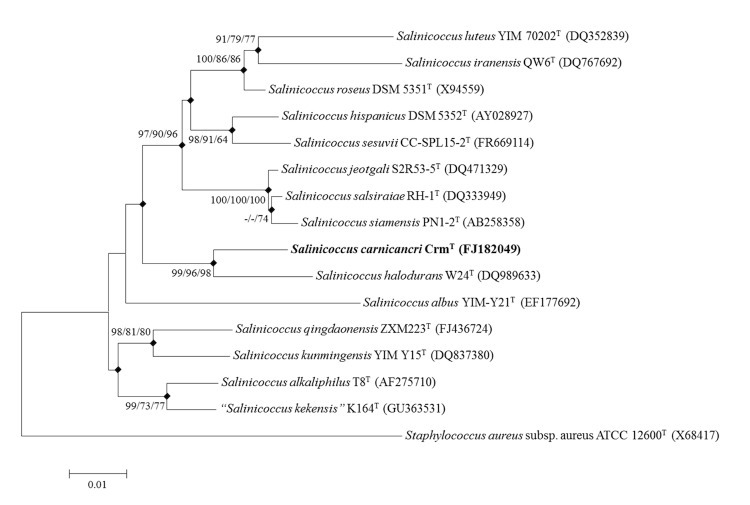 The present study summarizes the features of S. carnicancri strain CrmT and provides an analysis of its draft genome sequence, which is the first reported genome sequence of a species in the genus Salinicoccus. A taxonomic analysis was conducted based on the 16S rRNA gene sequence. The representative 16S rRNA gene sequence of strain S. carnicancri CrmT was compared with the most recent release of the EzTaxon-e database . The multiple sequence alignment program CLUSTAL W  was used to generate alignments with other gene sequences collected from databases. The alignments were trimmed and converted to the MEGA format before phylogenetic analysis. Phylogenetic consensus trees were constructed based on the aligned gene sequences using the neighbor-joining , maximum-parsimony , and maximum-likelihood  methods with 1,000 randomly selected bootstrap replicates using MEGA version 5 . The phylogenetic analysis based on the 16S rRNA gene sequence showed that strain CrmT was most closely related to Salinicoccus halodurans W24T with 96.99% similarity. The phylogenetic consensus tree based on the 16S rRNA gene sequences indicated that strain CrmT was clustered within a branch containing other species in the genus Salinicoccus (Figure 1). Phylogenetic consensus tree based on 16S rRNA gene sequences showing the relationship between Salinicoccus carnicancri strain CrmT and the type strains of other species in the genus Salinicoccus. The type strain of Staphylococcus aureus was used as an outgroup. The GenBank accession numbers for the 16S rRNA genes of each strain are shown in parentheses. Filled diamonds indicate identical branches present in the phylogenetic consensus trees constructed using the neighbor-joining (NJ), maximum-parsimony (MP), and maximum-likelihood (ML) algorithms. The numbers at the nodes represent the bootstrap values as percentages of 1,000 replicates and values <70% are not shown at the branch points. The scale bar represents 0.01 nucleotide change per nucleotide position. Strain CrmT (Table 1) was isolated from the fermented seafood ganjang-gejang during a project that investigated microbial communities in fermented foods, i.e., the Next-Generation BioGreen 21 Program (No. PJ008208) in Korea. Ganjang-gejang, with a NaCl (w/v) concentration of 24.5%, was produced by preserving scabbard crabs in soy sauce, garlic, and onions at –5°C for 4–5 days. Classification and general features of Salinicoccus carnicancri strain CrmT according to the MIGS recommendations . Evidence codes, as follows: IDA: inferred from direct assay; TAS: traceable author statement (i.e., a direct report exists in the literature); NAS: non-traceable author statement (i.e., not observed directly in a living, isolated sample, but based on a generally accepted property of the species, or anecdotal evidence). These evidence codes are from the Gene Ontology project . S. carnicancri strain CrmT is a Gram-positive, moderately halophilic, non-motile, non-sporulating, and aerobic heterotrophic coccus with a diameter of 1.0–2.5 μm . Figure 2 shows the morphological features of strain CrmT, which were obtained by scanning electron microscopy (SEM). Colonies were ivory-colored . Growth occurred at 4–45°C, with an optimum of 30–37°C, and at pH values of 6.0–11.0, with an optimum of 7.0–8.0. The salinity range suitable for growth was 0–20% (w/v) NaCl, with an optimum of 12% (w/v) NaCl . Strain CrmT contains menaquinone MK-6 as the predominant respiratory quinone . The major fatty acids (>10% of total fatty acid) are anteiso-C15:0 (40.61%), iso-C15:0 (22.0%), and anteiso-C17:0 (12.12%) . The major cellular polar lipids are phosphatidylglycerol and diphosphatidylglycerol . Glycine and lysine are the major amino acid constituents of the cell-wall hydrolysate . Scanning electron microscopy images of S. carnicancri CrmT obtained using a SUPRA VP55 (Carl Zeiss) at an operating voltage of 15kV. The scale bars represents 200 nm (left) and 1 μm (right), respectively. S. carnicancri strain CrmT was selected for sequencing because of its environmental potential as part of the Next-Generation BioGreen 21 Program (No.PJ008208). The genome project is deposited in the Genomes OnLine Database  and the genome sequence is deposited in GenBank. Sequencing and annotation were performed by ChunLab Inc., South Korea. A summary of the project information is shown in Table 2. S. carnicancri strain CrmT was grown aerobically in marine 2216 (Marine medium, BBL), supplemented with 10% (w/v) NaCl at 30°C. Genomic DNA was extracted using a Wizard Genomic DNA Purification Kit (Promega A1120), according to the manufacturer’s instructions. The genome of S. carnicancri CrmT was sequenced using a combination of a 454 Genome Sequencer FLX Titanium system (Roche Diagnostics) with an 8 kb paired end library, an Illumina Hiseq system with a 150 base pair (bp) paired end library, and a PacBio RS system (Pacific Biosciences). A total of 7,434,400 sequencing reads (443.6-fold genome coverage) were obtained using the Roche 454 system (187,030 reads; 12.1-fold coverage), Ilumina Hiseq system (7,219,019 reads; 408.4-fold coverage), and PacBio RS system (28,351 reads; 23.1-fold coverage) combined. The Roche 454 pyrosequencing and Illumina sequencing reads were assembled using Roche gsAssembler 2.6 (Roche Diagnostics) and CLCbio CLC Genomics Workbench 5.0 (CLCbio), respectively. Table 2 shows the project information and its associated MIGS version 2.0 compliance levels . The open reading frames (ORFs) of the assembled genome were predicted using a combination of the Rapid Annotation using Subsystem Technology (RAST) pipeline  and the GLIMMER 3.02 modeling software package . Comparisons of the predicted ORFs using the SEED , NCBI COG , NCBI Refseq , CatFam , Ez-Taxon-e , and Pfam  databases were conducted during gene annotation. RNAmmer 1.2  and tRNAscan-SE 1.23  were used to find rRNA genes and tRNA genes, respectively. Additional gene prediction analyses and functional annotation were performed using the Integrated Microbial Genomes - Expert Review (IMG-ER) platform . The draft genome sequence of S. carnicancri CrmT was 2,673,309 bp, which comprised three scaffolds that included 12 contigs. The G+C content was 47.93 mol% (Figure 3 and Table 3). RAST and GLIMMER predicted 2,778 coding sequences (CDSs) in the genome. Of the predicted ORFs, 2,700 ORFs were assigned to protein-coding genes. A total of 2,298 genes (82.72%) were assigned putative functions, whereas the remaining genes were annotated as hypothetical proteins. The genome contained 78 ORFs assigned to RNA genes, including 61 predicted tRNA genes, nine rRNA genes (three 5S rRNA, three 16S rRNA, and three 23S rRNA genes), and eight other RNA genes. The distributions of genes in the COG functional categories are presented in Table 4. Graphical map of the largest scaffold, C792_Scaffold00001.1, which represented >99.6% of the chromosome. The smaller scaffolds of the chromosome are not shown. From bottom to top: genes on the forward strand (colored according to COG categories), genes on the reverse strand (colored according to COG categories), RNA genes (tRNAs = green, rRNAs = red, and other RNAs = black), GC content, and GC skew. aThe total is based on either the size of the genome (bp) or the total number of protein-coding genes in the annotated genome. Numbers of genes associated with the 25 general COG functional categories. S. carnicancri CrmT encoded 72 predicted genes associated with the biosynthesis of compatible solutes and the transport of osmolytes, such as choline-glycine betaine transporter (BetT) and periplasmic glycine betaine/choline-binding lipoprotein of an ABC-type transport system (OpuBC). Potentially, these genes are key factors that allow S. carnicancri to adapt to high-salt environments (e.g., salt-fermented food) by regulating the osmotic concentration. Further studies are required to elucidate the osmoregulation mechanism, which could facilitate biotechnological applications of this halophilic bacterium. We gratefully acknowledge the help of Dr. Seong Woon Roh and Mr. Hae-Won Lee during SEM analysis (Jeju Center, Korea Basic Science Institute, Korea). This work was supported by a grant from the Next-Generation BioGreen 21 Program (No.PJ008208), Rural Development Administration, Republic of Korea. Ramana CV, Srinivas A, Subhash Y, Tushar L, Mukherjee T, Kiran PU, Sasikala C. Salinicoccus halitifaciens sp. nov., a novel bacterium participating in halite formation. Anton Leeuw Int J G 2013. DasSarma SAP. Halophiles. In Encyclopedia of Life Sciences, Nature Publishing Group 2002;Volume 8:458-466. Ludwig WSK, Whitman WB. Class I. Bacilli class nov. In: De Vos P, Garrity G, Jones D, Krieg NR, Ludwig W, Rainey FA, Schleifer KH, Whitman WB (eds). Bergey's Manual of Systematic Bacteriology, Second Edition, Volume 3, Springer-Verlag, New York 2009:p. 19-20. Prévot AR. Dictionnaire des Bactéries Pathogènes. In Hauduroy, Ehringer, Guillot, Magrou, Prévot, Rossetti and Urbain (eds) 2nd edition. Masson, Paris, 1953:1-692.